Brand new in original box. Take advantage of offered discounts and free shipping, and enjoy your top quality New Universal Front and Rear Blue Blilet Style 2pc Tow Hook Kit! 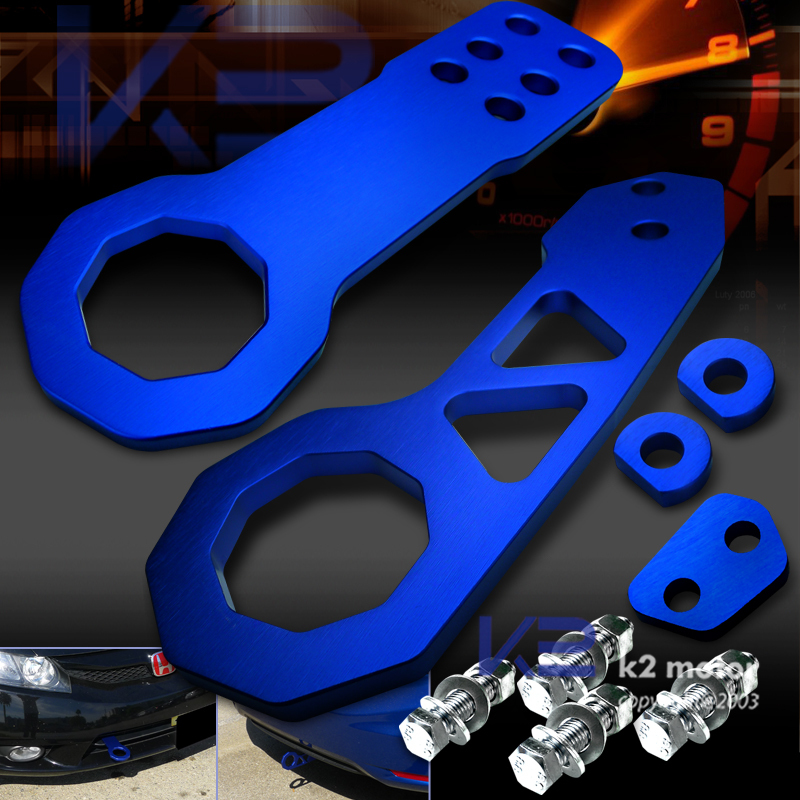 Brand New Universal Front and Rear Blue Blilet Style 2pc Tow Hook Kit. Tow hooks are a great addition to your ride. Not only does it give it a small kick in cosmetics, but if you plan on tracking your car, it makes it much easier to tow your car. These hooks hold up to 4000lbs of pulling weight. Some modifications will be needed to install tow hooks unless your car has factory access holes for the hooks. This kit comes with all necessary nuts and bolts for installation. all purchases made before 2:00PM PST will be shipped the same day. Any purchases made after the stated time will be processed and shipped the following business day. RETURNS & EXCHANGES - Our Policies and Promises to Our Customers. We offer a 30 days money back warranty. If a customer is not satisfied with the product or order for an reason within 30 days of the initial purchase date, the customer may contact our customer service department to request a Return Merchandise Authorization (RMA) application. Once we approve the RMA for your order, an RMA case number is issued and the customer may return the item for a full refund of the item price only. All returned item(s) must be in new condition in order to be approved by our RMA department. If it is determined by our RMA department that the item is in "New Condition" then the refund will be processed. We offer a 90 day limited warranty on any item(s) that confirm to be defective within 90 days from the initial purchase date. This warranty will only be applied to exchanges only; therefore no refunds will be covered under this warranty. All cases are authorized upon the discretion of our RMA department. Our Returns Merchandise Authorization (RMA) department reserves the right to reject any returns or exchanges for any item(s) returned past 90 days. How do I return an item(s) that I purchased? *Due to the nature of our products use, we usually do not accept returns but exceptions may be considered on a case-by-case basis. We advise that all customers consider the following before an RMA form is submitted. All returns will be inspected and approved by our RMA department. We require that all returns are shipped back in its original packaging. Any item(s) that are not returned in its original packaging is subject to a 20% restocking fee. Any returned item(s) not found to be defective, damaged, and/or in any claimed condition will be subject to a 20% restocking fee of the item(s) price. Customers are responsible for any return shipping fees. We do not accept Cash on Delivery (COD) returns at this time. What do I do if I received an incorrect product(s)? As a result of a large volume of shipments from our facility, we apologize if you receive an item(s) that you did not order and/or pay for. If such an event arises, please contact us so we can send a return authorization with a return label to you at no charge. In order to process the exchange in the best interest to both parties, we must receive the incorrect item prior to processing the exchange. If a suitable exchange cannot be made within a span of three weeks, we will gladly issue a full refund. What can I do if my purchased item(s) are defective? If your purchased item(s) do not fit properly and/or function properly, we will gladly replace it at no additional charge. Please contact our customer service department for assistance in obtaining an RMA case number.